Potholes.co.uk and The Daily Telegraph have teamed up to launch a campaign toidentify The UK's Worst Road. Conceived as a means to advance the road maintenance site's plight to improve thestate of the nation's road network, the joint campaign is urging disgruntled roadusers to name and shame a road they think deserves the title of Britain's worst. 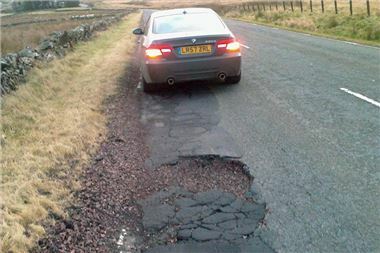 As the Department for Transport announces an extra £100m for councils across theland to fix potholes, motorists will know that some local authorities have tackledthe scourge of potholes better than others - so which region will acquire thedubious honour of being named home of the UK's most potholed road? Potholes.co.uk and The Daily Telegraph are asking road users to submit a road or tonominate one that has already been highlighted on the website. Visit: www.potholes.co.uk/worst-road-campaign and follow the simple instructions. There are two categories: Major Road; for motorways, A-roads and B-roads, and MinorRoad; for local roads (excluding private/unadopted roads). The users who submit the stretch of asphalt chosen as Potholes.co.uk's Worst Road in both categories will each receive a 32" Samsung LCD flat screen TV. Chris Knapman, Motoring Editor of The Daily Telegraph, said: "The campaign's a bitof fun but there's a serious message behind it - motorists are fed up with theperilous state of our roads." Duncan McClure Fisher from Warranty Direct, which set up Potholes.co.uk, said:"We've no doubt we are going to draw attention to some extremely shoddy roads and asa country we should be ashamed of them, as well as outraged at the thousands ofpounds of damage they do to our cars - perhaps something more will be done as aresult of our campaign." The closing date for entries is 5pm on Monday, 28 March, 2011.